Went to the range today and shot around 350 rounds of the Browning 40 gr "black" bullets that run at 1255 fps as stated on the box. At the end of the double tap practice round (I shoot USPSA and I use the TX22 for bulk shooting practice as its WAY cheaper!) I saw that I was getting keyholes at 15 yards. I meticulously clean all of my firearms each time after shooting them and I noticed that when I cleaned the barrel, I pushed out a significant amount of lead on half (one side) of the patch. I've read about folks describing chatter marks in their barrels so after a very thorough cleaning I really looked closely at my barrel. I can NOT see any chatter marks-HOWEVER-I did notice something very unusual with my years of experience building and shooting custom guns. It's pretty obvious to an OCD person (ME! ;-) ) that the edge of three of the lands that start at the end of the chamber cast a pronounced "shadow" as compared to the rest of them. The barrel has been meticulously cleaned to include running 2 patches of Flitz just to insure that there was nothing left in the barrel and that leads me to believe that there is a discrepancy with regard to the cutting of the rifling in the barrel. The three lands that have the pronounced "edge" as compared to the others are adjacent to each other so I'm assuming it was an issue during the rifling process. I'd noticed some lead being pushed out with the first patch before but didn't think much of it at the time. I own 4 custom 10/22's and a couple 22 target pistols and I've NEVER pushed half inch slivers of lead out of the barrel (that matched the lands) no matter HOW MUCH I've shot them. Al, everything else I purchased from you has been awesome so if you're listening, I'm ready to buy a standard length barrel (non threaded) any time you produce one! Last edited by copterdrvr; 04-12-2019 at 01:33 PM. I would send that in to Taurus for a look. Mine shoots beautifully. I'm pretty impressed with the construction of this pistol. I bet they an turn it around pretty quickly too with parts not having to come up from South America. Thank you for the compliment, but I think it will be faster to have Taurus address it. I've had the same exact problem with my wife's SR22. We only shoot copper plated stuff in it now and we don't have issues. I'm also impressed with the pistol and am happy with the general construction as well as the "general" accuracy but I'm always looking for the best out of what I've purchased. Yes I put a lot of rounds through it today and this is the first time I've seen any evidence of keyholes and they showed up at the end of the session. My pistol has a great trigger, never jams and is a great tool for USPSA practice. To me it's just an indication that there apparently is an issue with some of the barrels that have been manufactured and I enjoy shooting it too much to send it back for possibly months because the groups open up after about 250 rounds of Browning (which is really Winchester) ammo. I'll just keep shooting and cleaning it-which I do after EVERY trip to the range. P.S. I couldn't tell you how many 22's I've owned over the years and I've NEVER had one do this. When I look down my barrel I see some of the lands more pronounced than others. I can rotate/tilt the barrel and see the same thing from different angles so it's not like a light/shadow thing playing tricks on the eye. Is this what you are referring too? Exactly. And when I rotate the barrel the "high edges" follows the rotation. Yours is actually a bit more pronounced than mine is. Do you find that you actually push out "slivers" of lead when you clean it after a lot of shooting? Nice camera work by the way! Wow, that's actually quite significant. I too liked the gun when I first got it. 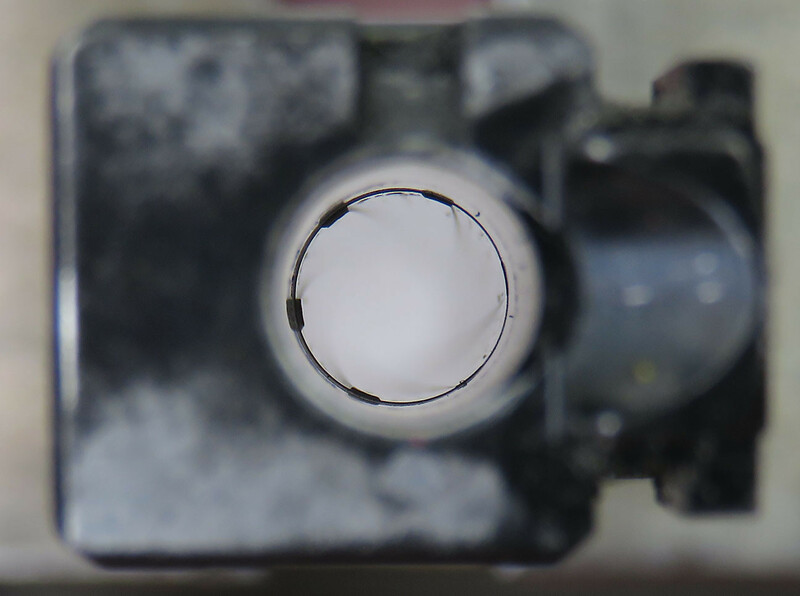 I have since found the rear sight to be garbage and now finding the poor rifling that will more than likely fill up with lead as you found out when you encountered keyholing. Another FU that should have never left the factory. Last edited by rws; 04-12-2019 at 05:57 PM. The rest of the barrel is nicely finished with no chatter marks. The rear sight is kinda weak but My intention from the gitgo was installing a Vortex Venom which I did using a Lakelinellc base plate. Still love the pistol and it's awesome with the Venom. I was shooting double tap drills, shooting almost continuously and was actually real close to 300 rounds when I noticed a couple keyholes. Pistol was PRETTY WARM and it was time to quit anyway. I shoot a Canik TP9SFX with the same Vortex sight in USPSA and the TX22 is an excellent low cost alternative to shooting the 9mm and regardless of the slight leading issue I still wouldn't trade it for anything else-the grip and trigger feels A LOT like my Canik. Last edited by copterdrvr; 04-12-2019 at 06:51 PM. That is great camera work. Seems like some tooling wasn't quite right.